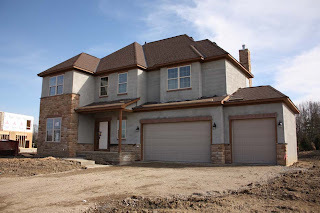 2012 BIA PARADE OF HOMES SUBDIVISION! Brand new "Valerie" model by Silvestri Homes. 1st floor Den/Possible In-law Suite w/connecting full Bath. Island Kitchen w/maple cabinets & granite countertops. Family Room w/coffered ceilings. Master’s retreat w/luxury whirlpool Bath. 5th Bedroom/Bonus/Nanny Suite w/full Bath plus finished lower level w/6th Bedroom/Den, full Bath & Wet Bar/Kitchenette. ~4300 SF on 1/3+ acre lot. Every upgrade imaginable! 4 BR’s & 5 Baths! Olentangy Schools! Only $459,900! Call DeLena Today!